(Images from Bert Hartmann) In 1934 Dr P Schmidt suggested that his pulsejet engine(which Argus developed) could be used to power a "aerial torpedo". Robert Lusser designed and developed this idea at Fieseler using the Argus As 014 pulsejet, in 1941 Fieseler were given the go a head for the development and production of this simple and cheap to make pilotless aeroplane, now called the Fi 103 V1. The aircraft was fitted with a simple guidance system using a gyroscope for direction / attitude and a distance recorder driven by a small propellor on the nose, at a preset distance the fuel was cut off the aircraft would than fall to the ground and explode, it was deployed against the British Isles from mid 1944. 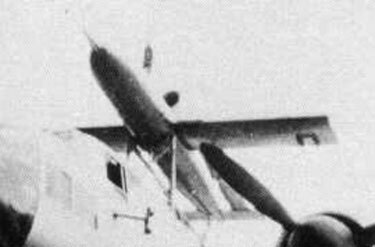 The problem with all this was that a pulsejet needs an appreciable speed to work, so conspicuous steam powered launch ramps had to be made, which were very vulnerable to air attacks. 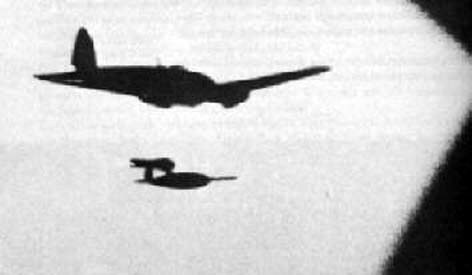 To solve this difficulty the Heinkel He 111 was modified (H 22) to launch the Fi 103 from the air in what is now called "stand off". Other developments were the "Reichenberg" Piloted Fi 103, and the American copy of 1944/45 the Republic JB-2 "Thunderbug" or "Loon"
After the war the French and the Soviets made copies of the Fieseler Fi 103, not much is known regarding the the Soviet effort. 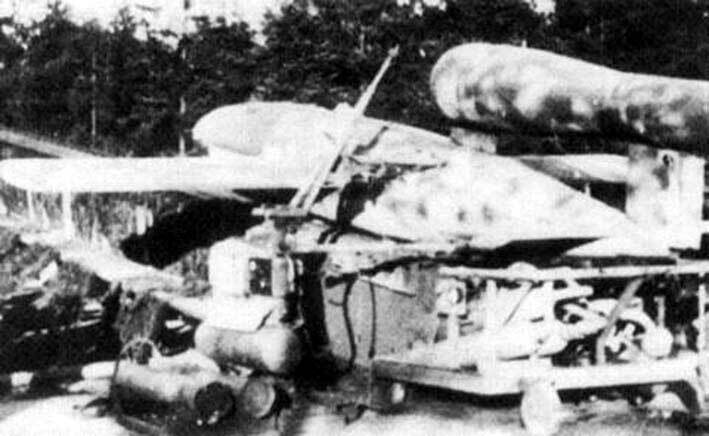 But the French version, the Arsenal 5.501 was used as a target drone until well into the 1950's. The main differences being the adoption of the twin tail arrangement and of course, the removing of the war head to be replaced by a guidance system.